The Incoherent Ramblings of a Stay at Home Mom: Whew! I am finally catching my breath. I have spent the better part of the last week in this fictional affair with a smokin' hot vampire. I have read all of the books, the leaked version of the 5th book on the internet, the deleted chapters, and have watched the trailers at least a dozen times. I am not kidding when I tell you that this has consumed me, and every other female that I know that's read the saga. I never understood the phenomenon that was Harry Potter, or Lord of the Rings, but now? I get it. I'm just so happy that I didn't get consumed in between the release of each book, the wait would have killed me. Being able to read them back to back was great. I would have lost my mind having to do it any other way. 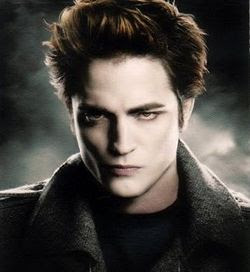 I decided getting out for a break would be a good idea, so I went to the movies with Kimtastic and Yankee Belle earlier this week, trying to clear my head of the dirty thoughts I kept having about Edward. It worked for approximately 1 hour and 49 minutes..... then it was back to naughty-ness. If you see the Husband walking around with bite marks, you will know we were playing vampires!! So, I'm a done, and I'm sad. I am left waiting for the movie and I guess starting the series over. Start Outlander. That will help you get over Edward. You so need to read The Host.